Manufacturers looking to sell most electronic products such as smartphones, vehicle remote controls, RFID sensors, low-powered transmitters, computers, networking and other telecom equipment here in the United States must ensure that their equipment won’t interfere with others or cause harm to the public. The Federal Communications Commission oversees requirements for testing and wants to make sure goods are safe and adhere to adopted U.S. technical standards. The FCC is in charge of monitoring devices that emit information across almost any radio frequency band and governing the potential for interference. Equipment must be tested before it can be marketed or sold in the U.S. When manufacturers sell equipment without the appropriate approval, they can be fined or even see their goods and profits seized. The FCC authorization process is a relatively simple process once your goods are ready to be mass-produced and sold to consumers. An FCC accepted Telecommunications Certification Body or laboratory will review the technical specifications of your device and results of testing. Your device is tested to see if it may cause interference with other equipment, broadcasts in the correct radio frequency range and if it meets broader telecommunications requirements. When you want your equipment tested and authorized, you’ll need to provide a set of technical specifications to NTS. After receiving your documentation, we’ll test the device to ensure it meets all FCC requirements. After the testing, you may need to apply for certification authorization from a Telecommunications Certification Body, and that’s a step we at NTS can help you with as well. What Is the Difference Between Certification, Declaration of Conformity and Verification? When you look at the FCC’s documentation covering its authorization processes, you’ve probably seen options for “Verification,” “Declaration of Conformity” and “Certification.” The guidelines can be a little vague on the difference, so let’s look into it. Verification: Devices without radio-communications capabilities often only need to be verified and can be tested by the manufacturer or laboratory. When these devices are found to be compliant, they can be marketed and sold without FCC approval. The tests needed for verification measure how much radio frequency energy is radiated by the device when powered on, ensuring they stay below a low threshold. The FCC lists common devices that only need verification including: Class A computer equipment, TV receivers, FM receivers, and some industrial, scientific and medical (ISM) equipment. Declaration of Conformity: This procedure requires an accredited laboratory to measure radio frequency energy from your device to ensure that it meets relevant technical standards. Declarations of conformity don’t require you to submit any device samples or data directly to a TCB. Common devices that require this declaration include Class B personal computers and peripheral devices; TV interface devices like set-top boxes and Internet-connected boxes; CB radio receivers; and super-regenerative receivers. You should discuss your declaration needs and questions with NTS before settling on just a verification plan. Protect your company and your equipment, especially if many consumers will enjoy what it provides. Certification: The most demanding of authorizations that we’re discussing is FCC certification. The FCC reserves this type of authorization for equipment that is most likely to interfere with other equipment, signals, and emergency information. Devices needing certification cover a wide range of industries and use cases: from smartphones and family radios to telemetry transmitters, microwaves and ultra wideband receivers. FCC Certifications are issued by Telecommunication Certification Bodies (TCBs). Depending on the device you make, you may also need to submit devices for testing by the FCC. What Products Need FCC Authorization? Most products that can emit radio frequency energy need to be evaluated for an FCC authorization. Specifics for understanding FCC authorizations can be a little tricky because the law the governs it, Title 47 of CFR , is difficult to read. The best rule of thumb is that any electronics device with the ability to oscillate above 9 kHz must get an FCC authorization, but there are exempted products. The products that need authorization are either intentional or unintentional radiators of radio frequency energy. So called Digital Devices are broken down into two testing classes: Class A and Class B. Class A covers devices that are used primarily in industrial, commercial and engineering settings. These are devices that will often be used during production, testing and operation in controlled environments. The Class B designation is reserved for consumer devices, and it is a stricter set of limits. How Do You Obtain FCC Authorization? 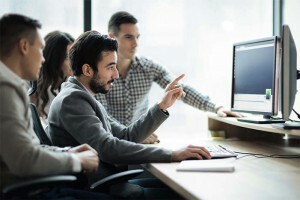 Obtaining FCC authorization can seem as straightforward as submitting your product and technical specifications to a testing lab and then sitting back to wait for the results. You can go that route, but you may risk products failing and not receiving enough information to properly fix any issue. We recommend that you start working with a testing partner such as NTS early on, so you can begin the device optimization process early, improving your chance for testing success. This is especially true for products that intentionally use RF where a certification authorization is required. Here are some of the steps we recommend any device manufacturer take when they consider FCC certification authorization. The tests your devices are submitted to often depend on the radio frequency used. Focus on the spectrum and match your components to that spectrum to start off on the best foot. Start by learning about what frequencies are legally open to you and your equipment. You can find the FCC’s current guidelines on radio spectrum allocation, to see what is available, what is restricted, and what is owned but has the potential to be leased. Determine what frequencies are available to you legally and then review the FCC documentation to limit any technical concerns. Research can reveal known issues that may increase the risk of interference, inhibit range and propagation, introduce requirements around antenna length or increase power consumption. After you’ve picked your frequency, review your designs to ensure that your antenna is optimized for the frequency. The governing sections of FCC Title 47 CFR Part 15 tell you of any harmonic or power limitations that your equipment must meet. Other FCC rules parts may also need to be consulted depending on frequency and use. Obtaining FCC certification is difficult if you’re not working with a production-ready device. Many manufacturers have started the certification process with an early-stage prototype, only to find they needed a significant redesign to have the device operate as intended. Your bottom line dictates that you need to move from concepts and prototypes to store shelves as soon as possible, but a major failure of an FCC certification test may send you back to the drawing board. Once you have a production-ready model, perform as many operational tests in-house as you can. These don’t have to be FCC certification tests – the results won’t count unless performed by an accredited partner – but should include testing to ensure you’re compliant with the appropriate FCC rule parts. Analyze output across any spectrum you can and verify that your antennas are optimally placed and designed. NTS can help you with these tests if you don’t have access to the right equipment in house. Early testing can move you through the certification process faster and help you correctly provide all of the necessary information. You need an FCC Registration Number (FRN) if you want to obtain certification authorizations for devices that use the radio spectrum. This number establishes that you’re doing business with the FCC or using a spectrum that the FCC has regulatory authority over. When you have your FRN and grantee codes in hand, it’s time to contact an FCC registered testing facility. There are many testing partners like NTS all around the U.S. Working with us can help you achieve all of the certifications you need, including defense industry compliance and FCC certification. Your lab partner should be able to perform as much of the testing as possible. We can help you with every aspect of testing, use our own equipment, walk you through test failures and successes, and work with you to help products pass tests. When working hard to get your product to market, diving into FCC guidance can create an undue burden. Many manufacturers have increased their cost and time-to-market by trying to perform FCC testing themselves. Allowing a lab to perform the work they’re certified to do is a smart way to keep your prototype on track. Lab quality, testing facilities, and capabilities can vary significantly, so we recommend working with NTS, the largest test laboratory network in North America. After you’ve selected a lab partner you trust, it’s time to provide them your equipment and information. Deliver the prototype that is closest to production-ready and all of its technical specifications to your lab partner. You can also have a representative observe the tests, but it is typically not necessary. Testing takes roughly two weeks – often less – and you can have a top estimate by reaching out beforehand and establishing a testing schedule with your lab partner. Labs will review your product and information, determine which specifications you need to have tested, and perform the tests the FCC will require. 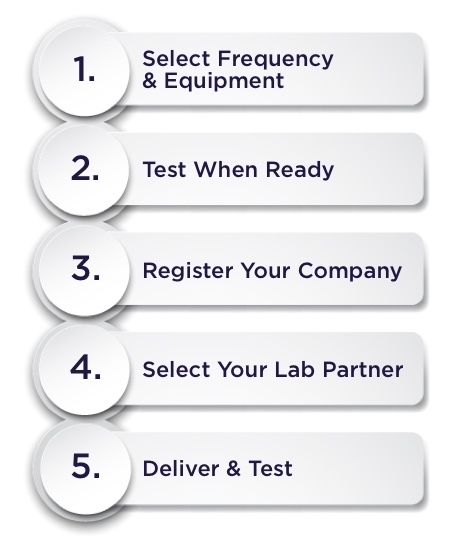 Your lab will also fill out all of the testing paperwork. We at NTS believe you should always work with a partner who has a verified process to double-check any documentation it produces. A TCB will issue your FCC certification. Your lab will need to provide the TCB with all of the relevant information and this body issues your certification on behalf of the FCC. Once the TCB uploads your information to the FCC database, the FCC will list your product on its approved list. The TCB will send you your Grant of Equipment Authorization. When you receive the grant, you can legally market and sell your product here in the U.S.
Portions of the documents submitted to the FCC can be restricted. That means portions of the filing such as schematics and block diagrams don’t have to appear on the FCC site. Both your lab and FCC will want to protect your intellectual property, but you need to ask for that help. One extremely important thing to note is that the FCC has very specific guidelines for how your product must show its regulatory information and FCC certification number. View their guidance here, but also check with your lab partner to ensure that you’ve included all of the relevant information. Testing with a certified partner like NTS can save you money whether you’re in need of certification or just a simple verification. Emissions monitoring, use of an anechoic chamber and filling out the documents required by the FCC can be a difficult endeavor. Save yourself the headache and the time by working with NTS and our in-house testing equipment. Not only will we ensure that all of the tests are performed and recorded correctly, but we can even work with you to resolve any issues causing a test failure. 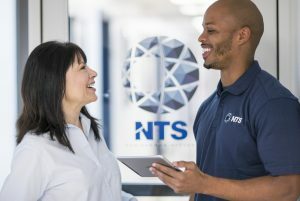 From working with you to find the right ferrite beads and inductors or design adjustments that can reduce unintentional radiation, NTS has the facilities and know-how to get your equipment into the hands of waiting customers. Contact NTS to learn about all of the testing facilities and capabilities NTS has to offer. Protect your bottom line and speed your time-to-market by working with us today.